Details: 3 Bedroom, 3 Bath Beachfront Property with 1,605+/- sq. 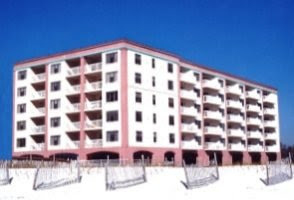 ft.
Gulf Shores condo for sale at Island Tower. This beachfront residence has two gulf-front master BR suites and exceptional views of the white-sand beaches and the warm emerald green of the Gulf of Mexico from the living area, both masters and the large private balcony. This exceptional residence includes upscale furniture, custom drapery and is tastefully decorated. The spacious kitchen features granite counter-tops and stainless steel appliances, fully equipped housewares & gulf views. Interior features include 8′ doors in the living area, tile flooring, high ceilings, recess lighting throughout and more. One of the master bathrooms includes a granite top double vanity & jetted-tub with a separate walk-in shower. Community amenities include outdoor & indoor infinity pools, exercise facility, sauna, BBQ grills. covered parking and more. Conveniently located near restaurants, shopping & entertainment….this could be what you’ve been waiting for!